Travel I-5 southbound to exit 182 to I-405 (Bellevue, Renton, Bothell). Proceed 6.5 miles and take exit #23A (on the right) onto WA State Route 522 East (Wenatchee, Woodinville). 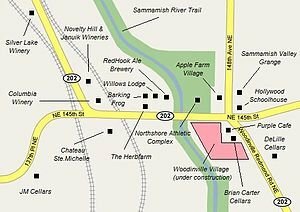 In slightly less than one mile, exit onto WA State Route 202 - Woodinville Redmond Road. Stay in the right lane. Drive past Dairy Queen and travel under the railroad bridge. Stay straight through the intersection and follow this road as it curves to the Kentucky Fried Chicken. Turn right on 140th NE and travel south to the new roundabout. Circle counterclockwise (3/4's way around) to enter Redwood Place parking lot at Mazatlan Restaurant. We're located at the north end of the building. From northbound I-405, take exit 20B - NE 124th St. Turn right, heading east off the exit ramp. Continue eastbound through Totem Lake Shopping District along 124th Street as this road dips down into the Sammamish Valley past the sod fields. At the light, turn left onto WA State Route 202 - Woodinville/Redmond Road. Follow this road north for approximately 1.5 miles through the 1st small roundabout. Immediately thereafter, turn right into Redwood Place parking lot. We are located on the north end of the building, next to Mazatlan Restaurant. Closed: Mother's Day, Easter, July 4th, Thanksgiving, Christmas and New Year's Day. May close for inclement weather; please call us.